ITER and INVOLCAN scientists travelled to the Philippines to strengthen the surveillance of the Taal volcano – ITER – Instituto Tecnológico y de Energías Renovables, S.A. The Taal volcano has erupted violently several times and is located about 50 kilometers from Manila, the capital of the Philippines. Scientist from ITER and the Volcanology Institute of the Canary Islands (INVOLCAN) have travelled to the Philippines during the second half of March to collaborate with the National Institute of Geological Sciences (NIGS) of the University of the Philippines in Diliman in order to continue strengthening the monitoring program of the Taal volcano. This scientific collaboration is developed thanks to the projects “Strengthening the volcanic early warning system in the Philippines by means of innovative geochemical methodologies”, co-financed by the Spanish Agency for International Cooperation for Development (AECID) and “Tenerife Volcano Disaster Assistance Team” co-financed by Tenerife Innova Programme 2016-2021 that is coordinated by the Tenerife Area 2030 of the Cabildo Insular de Tenerife. In this new scientific expedition of INVOLCAN-ITER in the Philippines, scientists of both entities have carried out the maintenance and calibration of the only permanent instrumental geochemical station for the continuous monitoring of the carbon dioxide (CO2) diffuse flux in the Taal volcano. This station was installed by INVOLCAN-ITER scientists in early 2016 to strengthen the volcanic monitoring program of the Taal volcano, one of the sixteen volcanoes of the Decade. Furthermore, the INVOLCAN-ITER-NIGS scientific team carried out a new scientific campaign on carbon dioxide (CO2) diffuse emission in the Taal volcanic lagoon to evaluate the possible spatio-temporal variations of the carbon dioxide (CO2) diffuse flux in the volcanic crater of the Taal volcano, and to estimate the rate of carbon dioxide (CO2) emission into the atmosphere by this volcanic system in order to compare the results with those observed in previous years. 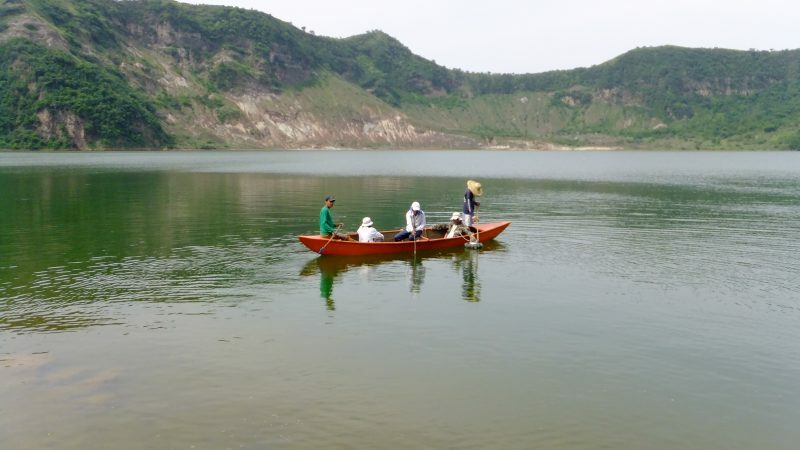 The preliminary results from this recent scientific campaign reflect that the carbon dioxide (CO2) diffuse emission by the Taal volcano’s crater lagoon has reached approximately 1,700 tons per day. This register is relatively higher than the emission considered as normal for this volcanic system, of about 500 tons per day, and relatively higher than the average value observed since mid-October of 2011 on the carbon dioxide (CO2) diffuse emission; of about 600 tons per day. The monitoring of this geochemical parameter, of interest for the volcanic surveillance, was already very useful to strengthen the alert system for potential adverse volcanic phenomena, since as a consequence of the registration of a very significant increase in the diffuse carbon dioxide (CO2) emissions, from approximately 500 to 4.700 tonnes, raised the alert level in the Taal volcano at the end of March 2011. Some of the results obtained during this recent campaign have already been sent for its communication and scientific dissemination at the next international congress organized by the International Association of Volcanology and Chemistry of the Earth’s Interior (IAVCEI), which will take place in Portland (Oregon, USA) from August 14th to 18th, 2017. Another of the main activities carried out under this cooperation project is the training of researchers from the NIGS of the University of the Philippines in Diliman on the use and application of geochemical techniques for the volcanic activity monitoring that contribute to the reduction of volcanic risk in the Philippines. The Taal volcano is located about 50 kilometers from Manila, the capital of the Philippines and has erupted violently several times causing the loss of human lives. Because of its proximity to populated areas and its history of eruptions, the Taal volcano was designated as one of the 16 “Decade Volcanoes” by the United Nations and IAVCEI in order to promote studies aimed at preventing future natural disasters related to the volcanic phenomena.